If you're a parent and you disagree with your child’s other parent or other family members about where your child lives, who they live with, and how often they see the parent they don’t live with most of the time, then this guide is for you. It explains how to sort things out between yourselves and if this isn't possible how to apply for a child arrangements order. Guides you step by step through the whole process, from start to finish. Explains what to do when you get your ex’s application if you are the Respondent. Explains when you have to prepare a statement and provides help to write one yourself. Boost your knowledge so you can do more to help yourself and spend less on lawyers' fees. Get the extended guide sent straight to your inbox now. Read it on your device or print at home. The standard guide helps you apply for a court order about the arrangements for your children by explaining what you need to do. It also explains what can happen at the various court hearings. I am the respondent. What do I do now I have received these court papers? Have you/are you representing yourself in court using Advicenow's resources? Would you be willing to talk to a friendly journalist about your experiences? If so - please contact us. • who else they should see. You may have split up recently or years ago, shared a home or never lived together. Maybe you had an informal agreement between you about your children but it no longer works for some reason. It doesn’t matter what is behind your disagreement; this guide is still for you. This guide will also be useful if it is not you but your ex or other family member who is applying for a court order. 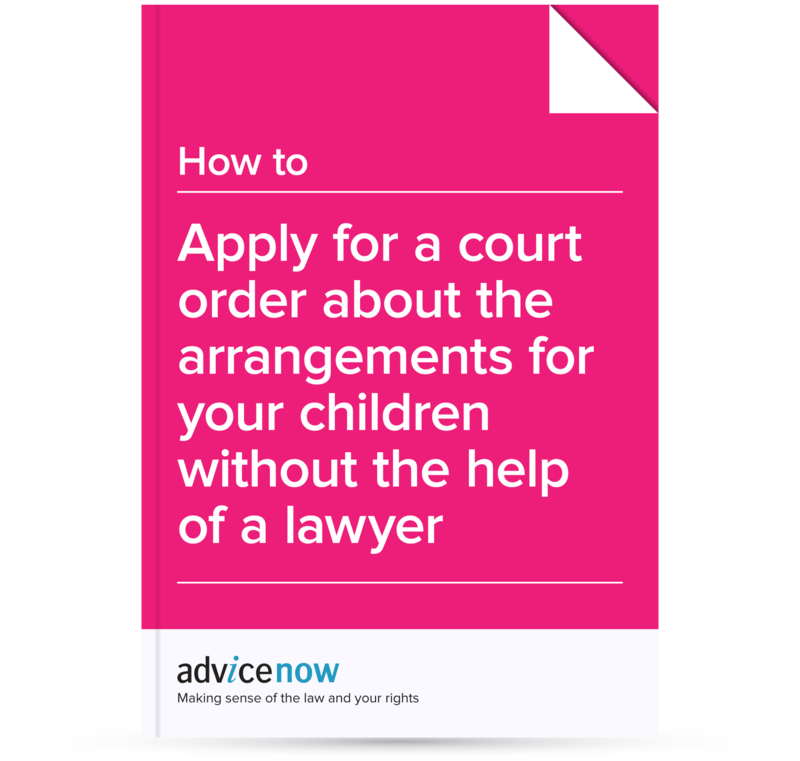 It explains how to apply for a court order about the arrangements for your children. These orders are called child arrangements orders. A child arrangements order sets out who your child or children will live with in the future, who they will spend time or have contact with, and when these arrangements will take place. It does not explain how to apply for an order for contact with your child if your child is in care – being looked after by the council. The guide assumes that you will be applying for a court order yourself, without the help of a lawyer. There is one court called the Family Court, which works in different places across England and Wales, and which deals with disagreements among separated families. These are not the same courts where people who are accused of doing something wrong go. As parents, you share responsibility for sorting out arrangements for your children. It is up to you to make every effort to agree how you will bring them up. If talking is difficult, help is available. In almost every case, courts expect both parents to see their children. This is because it is almost always in a child’s best interests to spend time with the parent they are not living with day to day. Sometimes (but not very often) courts make an order restricting or monitoring this time, for example, contact between a parent and child may be limited to letters, cards and presents. A court will only refuse to allow all contact in rare circumstances. If your ex does not pay maintenance or pays late, that does not give you the right to stop them seeing the children. If your ex stops you seeing the children, that does not give you the right to stop paying maintenance. These issues are not linked in this way, although people commonly think they are. A lot changes as children grow up. The arrangements you make now for your children may not be the right arrangements for them next year or in 5 years time. This is normal. Be ready to recognise this and adapt to meet the changing needs of your children. Whatever your situation, going to court is not the place to start. Before you apply for a court order about the arrangements for your children, the court requires you to find out about family mediation first, unless you can show that your case is exceptional (for example, where there has been violence or abuse between you). Family mediation is available whether you split up recently or years ago, shared a home or never lived together. Family mediation is not the same as ‘marriage guidance’; it is not intended to help you work out the differences in your relationship or about getting back together. In fact it is the opposite; family mediation aims to help you to agree how you will live apart. In a situation where you cannot agree about the arrangements for your children, a family mediator can help you discuss possible solutions. But it is not the mediator who makes the decisions or agrees to a plan; it is you. If you do end up going to court, the court will be concerned to help you and your ex agree things between you where possible. Courts prefer not to make a decision for you and think your own agreement is better in the long term for your children. If you represent yourself in any court proceedings without the help of a solicitor or barrister, then the law calls you a ‘litigant in person’. It is possible that you and your ex are both litigants in person. You may also hear people talk about ‘self-representing’. This means the same. We talk about the court ‘doing’ things quite a lot in this guide. For example, the court may ‘send’ out a form, ‘make’ a decision or ‘think’ about something. It sounds a bit odd because most people think of a court as a place, a building. But ‘the court’ is often used as shorthand to refer to the people working in the court, whether they are a judge or court staff. And that’s how we use the term here and how you will probably hear other people use it too. We use the word ‘ex’ in this guide to mean your child’s other parent. Legal aid is no longer available to pay for legal advice from a solicitor to help you apply for a court order about the arrangements for your children unless you can prove, for example, you have suffered domestic abuse or that your child is at risk of abuse from your ex. The law explains what a court needs to take into account when it makes a decision about your child. The court will consider your child’s welfare above all else. This is about trying to decide, sometimes in difficult circumstances, what is in your child’s best interests. The law makes it clear that the court must only make an order if doing that is better for your child than making no order at all. You may hear lawyers call this the ‘no order principle’. The court must also avoid any delay, where possible as it is generally agreed that delaying a decision is not usually good for children and can sometimes cause them harm. If it is important that the court makes a decision before a particular event takes place, for example, your child starts nursery or goes back to or changes school or moves to live with another family member, then the court should take this into account when they organise the hearing in your case. This does not mean that the court will do whatever your child says they want. But if your child is old enough to understand the questions they are asked and the court (with the help of a Family Court Advisor) can find out what they think, then it will consider what they say. For more information about Family Court Advisors see The Children and Family Court Advisory and Support Service (Cafcass or CAFCASS Cymru). The court will want to know that your child’s wishes and feelings are their own and have not been influenced by either of their parents. The court will pay more attention to the wishes and feelings of a child the older they are. In a few cases, the court may want to meet your child, or get a letter from them giving their views. This includes your child’s need for love and affection as well as for education, a home and food. It also includes things that can affect your child’s emotional well being. So if, for example, your proposals involve separating one child from his/her brother or sister, the court will consider how this will impact on their emotional needs. If you and your ex argue or resort to violence with your children around, again the court will take this into account. Change can be disruptive for children so the court will want to think about the effect on your child of any change you are suggesting, for example, in where they live or who they live or spend time with. Does the benefit of any change outweigh any possible negative effects? This includes any cultural, religious or language needs as well as any disabilities. Harm can mean ill treatment or damage to your child’s health or development, the impact caused by them seeing or hearing domestic violence or abuse or by preventing contact without a good reason. Can you protect your child from this kind of harm? Do you have the skills to look after your child and meet their needs? If, for example, you have drug or alcohol problems and these problems affect your ability to meet your child’s needs then this is something the court will take into account. The fact you have asked for a particular order does not restrict what a court can do. The court’s view about what is best for your children may or may not be the same as yours. There is always a possibility that neither you nor your ex gets what you asked for. The court’s duty to protect a child is so important that if, for example, it thinks your child is at risk of possible significant harm it could ask the local council to get involved. You can sort out the arrangements for your children by agreement at any time – either before or after you start court proceedings or without there being any court proceedings at all. Whether you manage to do this will depend partly on you and your ex’s attitude to solving your problems this way. Any agreement usually means being prepared to compromise – accepting less or giving more. But it may be worth doing this to avoid the uncertainty and expense of going to court. If you are not willing to negotiate and reach an agreement about the arrangements for your children then you may have no choice but to go to court. There are many services available to help you resolve your differences and come to an agreement about the arrangements for your children. You can find a list of recommended services here Signposting services. A parenting plan is a written plan worked out following negotiation between you and your child’s other parent or other family members. It sets out your decisions about the everyday, practical issues to do with caring for your children including how you are going to communicate about the children, living arrangements, money, education, religion and healthcare. A parenting plan can be a useful way of making sure everyone involved knows what is expected of them and creating some certainty for the future. For more information about parenting plans, the questions to ask and how to create one, see Parenting plan. If you would like to create your own parenting plan online you can do this here Splitting up? Put kids first. For a Welsh language version see Splitting up? Put kids first (Welsh language version). Experience suggests that reaching an agreement yourselves is usually better than the court telling everyone what to do. You are more likely to be satisfied with the outcome and stick to the decisions you have made together. And children do better when their parents and relatives cooperate with each other. Anyone thinking of going to court must attend a Mediation Information and Assessment Meeting (MIAM) before making an application unless the requirement doesn't apply because, for example, they are applying for a consent order or are exempt. This applies whether you are applying for a court order yourself without the help of a lawyer (you are a ‘litigant in person’) or you are represented by a lawyer and whether you have legal aid or not. assess whether mediation is a safe way for you and your ex (or other family members) to try and sort out your disagreement. You contact an authorised family mediator to set up a Mediation Information and Assessment Meeting. They will invite you to attend a MIAM either separately or together with your ex. You can find an authorised family mediator by searching here Family mediator search or here Find a legal adviser or family mediator. Completes the relevant part of the C100 form if you want to make a court application. For more information about how these meetings work, see The assessment meeting (MIAM). Mediation aims to help you communicate with one another now and in the future and to reduce the extent or intensity of any dispute and conflict within your family. Trained mediators can help you talk to each other and find solutions, even when it is hard. They are there to assist you both and can provide you with a safe and supportive environment where you can work out solutions together. But, nobody has to use mediation. Once you have been to the Mediation Information and Assessment Meeting, you or the family mediator may decide there are reasons why mediation will not work for you. This may be because there has been domestic abuse in your relationship. It may be that one or more of you have a drug or alcohol problem or a mental illness. That problem or illness may create such a big risk that it isn’t safe for mediation to take place. There are some circumstances when you don’t have to attend a Mediation Information and Assessment Meeting. For example, if your application is urgent or where there has been domestic violence between you. You can find the full list of circumstances in which you can ask the court to agree that you don’t have to attend a Mediation Information and Assessment Meeting (the law calls this ‘claiming an exemption’) here MIAM exemptions. If you want to claim exemption from attending a Mediation Information and Assessment Meeting, there is a section of the C100 application form you must complete if or when you apply for a court order. You can find a link to this form here Application form for a child arrangements, prohibited steps or specific issue order (C100). Charges vary from one mediation service to another and often according to your gross annual income. When you phone a family mediator to arrange a Mediation Information and Assessment Meeting, ask about how much they charge. Some make no charge for the Mediation Information and Assessment Meeting itself but charge for completing the relevant section of the C100 form. If either you or your ex is entitled to legal aid then the initial Mediation Information and Assessment Meeting, completing the relevant part of the C100 form and the first mediation session are free for both of you. After that, any further mediation sessions will only be free for the person who has legal aid. You may also be able to get legal aid for help from a solicitor during the mediation process. If you are the person who isn't eligble for legal aid, you will have to pay for any mediation sessions after the first one. You can find a link to Form C100 here Application form for a child arrangements, prohibited steps or specific issue order (C100) There is a checklist and information notes at the back to help you complete the form. You can find the Child Arrangements Programme here Child arrangements programme. And court guidance about Mediation Information and Assessment Meetings (MIAMs) here Practice direction 3A - Mediation Information and Assessment Meetings. For more information about making an application, see court leaflet CB1 Making an application - children and the family courts. For more more information about the court process, see court leaflet CB7 Guide for separated parents: children and the family courts (CB7). Whether you are using a solicitor or doing it yourself, it’s useful to have an understanding of what is involved in a typical application for a child arrangements order. Even though your case may be different, we hope this example makes the process seem a bit less daunting. You will come across lots of new technical words. This is the jargon that lawyers and court staff use. We think there's no getting around it; you have to understand what it means too. We explain these words here: What does it mean? (Child arrangements). The story so far.......Pat and Mo have 2 children; one is 7 years old and the other is 5. Pat and Mo no longer live together. Mo looks after the children on a day to day basis. Pat used to see the children regularly but Mo is now telling him that his visits unsettle the children and that he cannot see them for the time being. Pat suggests they visit a family mediator but Mo is not willing to do this. This is a step by step description of how Pat applies for a child arrangements order. 1. Pat finds a family mediator, asks about their charges and arranges a Mediation Information and Assessment Meeting with them. For information about how to find a family mediator, see More help and advice - child arrangements. 2. The mediator invites both Mo and Pat to attend this meeting but only Pat goes along. At the end of the meeting the mediator fills in part of the C100 form and gives it to Pat. You can find more information about this form in our extended guide. 3. Pat fills in the rest of the C100 form as fully as possible and signs and dates it. It is very important Pat provides all the information the form asks for about Mo including details of her previous addresses for the last 5 years. If he doesn't, this will hold up his case. 4. Pat goes to his local library and makes 3 photocopies of the completed C100 form. 5. Pat checks whether the family court charges a fee for this kind of application and whether he is eligible to get help paying the fee. For information about court fees, see Going to court - the basics (child arrangements). 7. The court issues the proceedings and sends Pat a copy of his application together with a Notice of hearing. This tells Pat when and where the first meeting with a judge will take place. 8. The court serves a copy of the C100 form together with a Notice of hearing, Directions on issue and Acknowledgement form (Form C7) on Mo. You can find more information about these forms in our extended guide. 9. The court sends a copy of Pat’s application to Cafcass or CAFCASS Cymru. A Cafcass officer checks to see whether the council or the police have any knowledge or worries about the children and also speaks to both parents separately on the phone. The court also tells Pat and Mo if there is anything else they need to do before the first hearing. Cafcass stands for Children and Family Court Advisory and Support Service. Cafcass operates in England and CAFCASS Cyrmru in Wales. For more information see The Children and Family Court Advisory and Support Service (Cafcass or CAFCASS Cymru). 11. Pat and Mo cannot agree about allowing Pat to see the children and so the judge makes directions instead. The judge tells both Pat and Mo to write a statement setting out their views and gives them a deadline for doing this. The judge also asks the Cafcass officer to prepare a report and make a recommendation and fixes a date for the next hearing, a Dispute Resolution Appointment. 12. Pat and Mo write their statements and file them at court in good time before the deadline. They each send a copy of their statement to the other. 13. The Cafcass officer visits Pat and Mo separately, meets the children and writes a report recommending that Pat spends time with the children once during the week and has them to stay every other weekend. 14. At the Dispute Resolution Appointment, the judge explains to Mo that the Cafcass report recommends that the children spend time with Pat, and that this is likely to influence the judge’s decision if the case goes to a final hearing. The judge encourages Mo and Pat to reach an agreement in line with the report’s recommendation. Despite the Judge’s encouragement, Mo and Pat still cannot agree. 15. At the final hearing, Mo and Pat take it in turns to tell the judge what they are finding difficult to agree and what result they are looking for. 16. The judge discusses the recommendation in the Cafcass report with Pat and Mo. 17. Mo and Pat each decide that they will go along with the Cafcass officer’s recommendation. 18. The court makes an order. 19. The court gives Mo and Pat a copy of the order before they leave court. In this section we explain which court to use, where you can find the forms you will need and information about court fees and court rules (Family Procedure Rules). We also talk about how much it could cost and how long it will take. You can apply to any Family Court but you will probably want to apply to the one nearest to the children. You can find the contact details and opening times of all courts here Find the right court or tribunal. It is hard to say, but the length of a case is likely to depend on the number and complexity of things you disagree about. But courts are very aware that any delay in decisions affecting children is not good. So, most cases take weeks or months rather than years. Your family court will have the forms you need and should send them to you for free. Otherwise you can find the forms you need here Search for court forms and leaflets. We will try and help by including a link to those forms that are most relevant in this guide. Where the form is also available in the Welsh language, we include a second link. How much it costs you will depend on whether you deal with all the paperwork yourself or pay a lawyer to do some or all of it for you. Lawyers charge for their time. So, usually, every time you write, email or phone, they will charge you for the time they spend reading what you say, thinking about what advice to give you and giving you that advice. The more often you contact them, the more time they spend negotiating on your behalf or representing you at court hearings, the greater the cost – to you. If you use a lawyer, the key is to use their time carefully. So prepare a list of the points you want to make and questions you want to ask before you speak to them. Legal costs can add up to thousands of pounds. This is one reason why courts encourage people to mediate and reach an agreement either without going to court at all or before the final hearing. More and more lawyers are offering packages of legal services for a fixed fee. Sometimes these services include a free first meeting. We suggest you ring round or email several to check what they offer for the price they are quoting. What will they do for you? What do they expect you to do? You can also pay for a lawyer to give you a specific piece of advice or do a specific task. So, for example, you could decide to pay them just to prepare your application. If so, ring round and ask for a quote for doing this job. You might want to pay them to be available on the phone on the date of the first hearing to answer your queries or to represent you at the final hearing. You can also consult a barrister directly without having to involve anyone else (for example, a solicitor). For information about the Public Access scheme, see Public access to barristers. You should only have to pay for your own costs (not your ex’s as well) unless the court decides you have run your case unreasonably. That might include not doing what the court has ordered, failing to turn up for hearings, misleading the court or your ex or continue trying to make unreasonable arguments. You usually have to pay a family court fee when you start (issue) proceedings about the arrangements for your children. For information about family court fees and when and how to pay them, see Civil and Family Court Fees. You can ask for help paying court fees by completing form EX160. You can find this form here Apply for help with fees and notes to help you complete the form correctly here How to apply for help with fees. For a Welsh/English version of the form see Form EX160 (Welsh/English version) and of the notes see How to apply for help with fees (EX160A - Welsh/English version). You can work out if you are likely to be eligible by using the online Fee Remissions Contribution Calculator (EX 160C). To find this calculator, type ‘EX160C’ into the search box at Search for court forms and leaflets. A quick look will probably just confirm your worst fears; there are loads of them. And an individual rule often comes with one or more additional bits of guidance, called ‘practice directions’. The good news is that only a few rules and practice directions are likely to apply to your case, unless it is very complicated. So it is not like a book, you don’t have to start at the beginning and read all the way through to the end. You need to pick out the rules that are relevant to your case. We will try and help you do this by including any key rules in this guide. Write your case number on any letters, documents or forms you send to the court. This way they will get linked up with your case. The case number is how the court is able to identify all the papers in your case. You will find your case number on any letters or documents about this case that you have had from the court. Keep copies of any letters you send, emails sent and received and original letters received as well as court papers in date order in a folder. Buy our extended guide for more information about who can apply for this kind of court order, how you apply, what forms you must fill in, how you will know you have successfully started your case, who you have to tell about your application and what happens next. Collect any information you need, for example, a copy of a previous court order about your child or children, previous addresses in the last 5 years. Sign and date the form (if necessary). Work out how many copies of the completed forms you need. If you are not sure, ask the court office. Attach any Parenting Plan you have completed in the past or any summary of the progress you are making with producing a Parenting Plan. Make the required number of copies of the completed forms. Copy any previous court orders about your children. Send or take your application and other documents together with the correct number of copies to the family court. For step by step guidance on how to respond if you've been sent a copy of your ex’s application for an order about the arrangements for your children, buy our extended guide. In this section we explain what the Children and Family Court Advisory and Support Service is and what they do. There are two of these services; one in England and one in Wales. The service in England is called ‘Cafcass’ which is short for the Children and Family Court Advisory and Support Service: Cafcass (England). In Wales the organisation is called CAFCASS Cymru: Children and Family Court Advisory and Support Service (CAFCASS) Cymru. Both organisations provide advice and support to help family courts and families make decisions in the best interests of children. A Cafcass officer (in Wales, a Welsh Family Proceedings Officer) - sometimes also called a Family Court Advisor - is a specialist social worker whose job is to help you agree the arrangements for your children if possible, carry out safeguarding enquiries and, if asked by the judge, write a report for the court about your children’s needs. Once they get a copy of your application, Cafcass or CAFCASS Cymru will carry out safeguarding enquiries (you may also hear these called ‘screening checks’) to make sure your child is safe and not at risk of harm. Screening is the process of asking for, receiving and closely inspecting information about the adults and children involved in your application. looking at the C1A form (if you have filled one in) and deciding whether they think there is a genuine risk of harm. This information is then provided to the court, usually in time for the first hearing. Cafcass or CAFCASS Cymru will usually give this information to you too. If they don’t then the court will tell you what’s in the information unless it thinks that doing this might create risks for you or your ex (or other family member) or your child or children. If the judge asks, a Cafcass officer will write a report for the court about your children’s needs. The judge may ask the Cafcass officer to focus on one or more particular issues which you disagree about. In this section we explain what happens at the first meeting (hearing) you have with a judge. In some cases you may be told to do something before you go to court for the first hearing; if so you will receive an order from the court. For example, you may have to provide a summary explaining what progress you and your ex have made in producing a Parenting Plan or attend a Mediation Information and Assessment Meeting if you have not been to one, and the Judge decides that you have wrongly claimed to be exempt. The first hearing usually takes place about 4-6 weeks after you start your case. You and the respondent must both attend. If you don’t turn up, the court can refuse your application or go ahead without you. It the respondent does not turn up, the court can go ahead as long as it thinks the respondent knew about the hearing. If neither of you attend, the court may refuse your application. The hearing usually lasts between 30 minutes and 1 hour. You will meet a judge and a Cafcass officer (in Wales, a Welsh Family Proceedings Officer). They will want to be clear what you agree about and where you disagree. They will try and help you find a solution to some or all of the issues you can’t agree about. The Cafcass officer will try and talk to each of you before the hearing. you and the respondent must prepare and file a statement. You can find more information about how to prepare a statement in our extended guide. a fact finding hearing should take place. This is a special hearing which the court may arrange so that a judge can decide whether there is any truth in the allegations of domestic violence or abuse made by either of you. This hearing will be arranged if the judge considers that the allegations (if true) would be likely to affect the final decision of the court and there is no other way of dealing with the case properly. to make a final order. If the court cannot make a final order, it will make an order for directions. This is a list of instructions telling you and your ex (or other family member) what to do and when and is how the court manages the case to make sure it makes progress. If possible, the court will give you a copy of the order it makes before you leave the courtroom. If there are things in it you do not understand, say so, politely. You should know if there is going to be another hearing in your case and the date, time and location of that hearing before you leave the court. If you don’t, again, ask. You can find a link to the court rules about the First Hearing Dispute Resolution Appointment (FHDRA) here Practice direction 12B - First Hearing Dispute Resolution Appointment (FHDRA). The judge will think about how your child should be involved in any decision made. Depending on how old they are, their wishes and feelings must be considered. Often a Cafcass officer or social worker will do this by talking to your child. Sometimes a child might want to write a letter to the judge or meet them. The judge will ask for your views about this. If the judge does talk to your child they won’t ask them what they want to see happen. Instead it’s an opportunity for your child to see that the judge has understood their wishes and feelings. It is also allows your child to see the place where important decisions are being made about them and meet the person making them. The judge will also want to think about how your child should be told about the decision once it is made. It may be that you or your ex can do that or perhaps a Cafcass officer or social worker if that would make things easier for your child. If court proceedings start, it is very common for arrangements for the children to be sorted out by negotiation and agreement at the first hearing. The details of what you have agreed will be recorded and approved by the court. If the court thinks you can stick to what you have agreed, it may decide not to make a court order at all, even an order that you both agree to (a consent order). However the court will make an order if it thinks that would be best for your child or children. Who can come to the hearing? The first hearing (and any later hearings in your case) will be held in private. However, that doesn’t stop you bringing a friend or family member along to court with you for moral and practical support. If you want them to go into court with you, you will have to ask the judge. Sometimes that will be okay, especially if you can explain why it would help you for them to be in court with you. But be prepared for the judge to say no, in which case they will have to wait outside for you. You can take someone into the hearing with you if you want them to act as your McKenzie friend (supporter) but they will not be able to speak on your behalf. They will almost certainly need to tell the Judge who they are, and a little about themselves. They should have no involvement in the case. Tell the judge as soon as possible if you want someone to take on this role. You can find the guidance explaining what McKenzie friends can and cannot do here Practice Guidance: McKenzie Friends (Civil and Family Courts). The judge can ask your McKenzie friend to leave the court if they behave in a way that interferes with the court doing its job, for example, if they make loud comments. There are strict rules about whether and when the media are allowed into court in family cases. For information about whether and when the media can attend the hearing about the arrangements for your children, see Can the media attend my court case? Here is the same leaflet in Welsh/English: EX 711 A gaiff y cyfryngau fynychu fy achos llys? The Personal Support Unit has volunteers based in some courts who may be able to help, for example, by accompanying you to and from a hearing. If you are unable to reach agreement at the first hearing, it may be that the court will postpone (adjourn) the case to get a Cafcass report on the children or to investigate allegations of domestic abuse. When this further information is available, the judge may ask you to attend court for a Dispute Resolution Appointment. At this hearing the judge will explore with you whether you and your ex (or other family member) may be able to agree arrangements for your children, even at this late stage. It is generally better if you can agree things between you rather than have a court impose an order on you. If you are unable to reach agreement, the judge will order that the case is listed for a final hearing. give final case management directions. These can include instructions about what further evidence you must file, whether you must file a statement, whether you need a file containing the relevant papers for the hearing and the date of the final hearing. In this section we explain what a final hearing is, what happens in it and how to get ready for it. The final hearing is when a judge hears the evidence and makes a decision. But this only happens if you cannot reach an agreement yourselves. People often think that the judge will run the hearing; that the judge will ask their ex questions, give them a hard time or unpick the evidence to get at the truth. Judges will help where they can (particularly if they think that you are struggling) but if it is your application, generally you have to be prepared to take the lead. Judges vary in how they start a final hearing. They should explain what is going to happen and put you at your ease. The judge may invite you to speak, or not. They may just expect you to stand up and start. If you are not sure what to do, just stand up and say something like, ‘Would you like me to start now?’ If you don’t know the judge’s name or how senior they are, it is best to call a man ‘Sir’ and a woman ‘Madam’. Sometimes hearings take place in rooms rather than in courts and you may not need to stand up when speaking. If you're not sure about where you should sit and whether to stand or stay sitting when speaking, just ask the judge. You and your ex will each have a chance to tell your story (the law calls this ‘giving evidence’). You will have to make a formal promise to the court to tell the truth (the law calls this ‘take an oath’ or ‘affirm’). Whoever is the applicant goes first and the respondent second. If your ex is represented by a lawyer, then the lawyer will get them to tell their story by asking them questions. When your ex finishes telling their story, you and the judge can ask them questions. When you finish telling your story, the judge (or your ex’s lawyer if they have one) can ask you questions. The Judge will help with asking questions where necessary. When you ask questions, make sure they are questions and not speeches. If Cafcass or CAFCASS Cymru has prepared a report, the author of the report usually attends court for the final hearing. This will give you, your ex and the judge an opportunity to ask them questions about what the report says and the recommendations. The judge decides what orders to make about the arrangements for your children and explains the reasons for their decision. Sometimes this will not happen on the same day as the full hearing because the judge needs more time to think about your case. In this situation you will be asked to come back to court another day. You won’t have to wait too long, maybe another week or so. If you don’t turn up to the hearing, perhaps because you are feeling sick with nerves, it will usually still go ahead. To avoid this, try and get a friend to go with you. If you don’t go, it is likely that you will lose your case. If you have a good reason for not being able to get to court, it is really important that you phone the court office and ask them to get a message to the judge explaining the reason. The judge will then know that you are not simply avoiding the hearing. If you are genuinely too ill to attend court, you will usually have to provide a letter from your doctor to confirm this. Make sure you have done everything the court has asked you to do. Have you sent all the documents you were told to send to the court? Make a note of what you want to say at the hearing so that you can refer to it. This will help you not to forget anything. You may think that what you want to say on the day will just occur to you at the time. But you cannot rely on this. Think about and plan the questions you want to ask your ex. Have a summary ready of what you want the court to order. You can find a Welsh/English version of the leaflet Your first time at court? What you can expect here: Eich tro cyntaf yn y llys? Beth y gallwch ei ddisgwyl (EX370). You don’t have to speak in legal language or long words - use plain English. Ask questions if you feel unsure about what is going on. The Judge is not ‘for’ or ‘against’ you; that is not their job. They will usually help or prompt you when necessary. Take notes of what the other party says. There may be a point you disagree with and having notes will help you to argue your case more convincingly. When someone asks you a question listen to it carefully and answer the question you are being asked. If you don’t understand the question, say so and ask for it to be put in a different way. Take someone else with you to take notes for you when you are speaking. There will be times when you can’t do both! In some courts a volunteer from the Personal Support Unit may be able to come with you. Take notes of the Judge’s order at the end. Ask the Judge what the order means if you don’t understand it. There are strict rules about who you can communicate with about your case. You can find a Welsh language version of the same leaflet here EX710 A gaf i siarad am fy achos y tu allan I'r llys? A statement is a written summary explaining your view of the background to the disagreement between you and your ex, what has caused you to come to court, what you want the court to do and why you think this would be best for your children. Buy our extended guide for more information about when you have to prepare a statement, an example of a statement and top tips to help you write one yourself. To book an appointment please check their website: Royal Courts of Justice Advice Bureau for latest appointment details. For support or to discuss your options you can call the National Domestic Violence Helpline on 0808 2000 247 or in Wales, Live Fear Free on 0808 80 10 800. Both help lines are open 24 hours and are for anyone who is experiencing, or has experienced domestic abuse, or for anyone who is worried about domestic abuse happening to a friend, family member or colleague. It is free, confidential and the number will not show up on a BT telephone bill. If you are a man and you or your children are affected by domestic violence or abuse you can contact the Men's Advice Line 0808 801 0327. The National Centre for Domestic Violence provides a free, emergency injunction service to survivors of domestic violence regardless of their financial circumstances, race, gender or sexual orientation. You can contact them on: 0800 970 2070. Alternatively you can text: NCDV to 60777 and they will call you back. Dyn Wales provides support to men who are experiencing domestic abuse from a partner. You can contact them on 0808 801 0321. Acknowledgement (Form C7) - is the form the respondent uses to tell the court that they have seen the application about the arrangements for the children. Acknowledgement of service – the respondent ‘acknowledges service’ when they reply to the court (usually by filling in and returning a form) agreeing that they have received the application about the children. Allegation - a claim that someone has done something wrong. Applicant – the name given to someone who applies to a court for a court order. Bundle - an information pack that pulls together all the information and evidence relevant to the case in one place. It makes it easier to refer to information during a hearing. order about the arrangements for the children. Cafcass – Cafcass stands for Children and Family Court Advisory and Support Service. Cafcass operates in England. CAFCASS Cymru – CAFCASS stands for Children and Family Court Advisory and Support Service. CAFCASS Cyrmru operates in Wales. Cafcass officers (sometimes also called family court advisors) – are specialist social workers whose job is to help parents agree the arrangements for their children (where this is possible) and write reports for the court about the needs of children. Child arrangements orders – an order which sets out the arrangements about who a child is to live, spend time or have contact with and when. Confidential contact details Form C8 - the form you fill in if you don’t want to reveal your contact details (your address, telephone number, email address) or the contact details of your child or children. Form C8 is just for the court – so they know where you are and how to get hold of you. The information you give on it will be kept secret unless the court orders differently. Directions on issue - instructions given at the very beginning of a case telling you what to do and when. Dispute resolution – this refers to ways of sorting out disagreements without going to court. It includes methods such as mediation and arbitration. Dispute Resolution Appointment (DRA) – this is a court hearing which takes place towards the end of the court’s involvement in your case. It gives you another opportunity to see if you can sort out your disagreement with the help of a judge. File – you file something at court, for example legal forms or documents, when you either take or post them to the court office. First Hearing Dispute Resolution Appointment (FHDRA) – the court hearing which takes place at the beginning of the court’s involvement in your case. Hearing – the name given to a meeting with a judge or magistrates. Issue – officially start court proceedings. Litigant in person – this is what the law calls you if you represent yourself in court proceedings without the help of a solicitor or barrister. Notice of hearing - this tells you that a court case has started and when and where your first meeting with a judge will take place. Order for directions - this is a list of instructions telling you what to do and when. Party – this kind of ‘party’ isn’t about balloons and dancing. It’s a person or group of people forming one side in a dispute. Proceedings – court action taken to settle a dispute. Respondent – this is the name given to the person or people you have to give a copy of your application for a court order to. A respondent can then reply (respond) to your application. Serve – delivery of court documents, usually by post. In some circumstances, the courts also allow delivery by email. Settle – sort out the case with your ex or other family member by reaching an agreement. Statement – this is a written summary of the background to the disagreement, any recent events that have caused the application and what should happen in the future. Welsh Family Proceedings Officers - are specialist social workers whose job is to help parents agree the arrangements for their children (where this is possible) and write reports for the court about the needs of children. Are you willing to talk about your experience? If you are representing yourself in court and would be willing to speak to a friendly journalist about your experience, how difficult it is, and anything you have found that has helped, please contact us. You needn't use your real name if you don't want to. We would always check with you before passing any of your details on to anybody. This guide was originally written and produced by Advicenow with assistance from the Family Justice Council. We would like to thank all those who provided feedback on this guide. I'm new in the country and facing Domestic violence from my husband. No money to pay to lawyers, no family around. All information I've got from Advicenow let me feel strong again. Full, in detail and comprehensive guide that clearly depicts each step of the way and where to find support and links for each section. Cannot recommend enough. Thank you so much! Amazing website. Prompt reply to a querry regarding a free leaflet. This has helped me emensely in understanding the law as i navigate my divorce. Thank you. Wow! I simply cannot express how much I appreciate the help and compassion of you extremely supportive staff and amaIngly helpful guide! The information supplied was a great help, and made the process less daunting, there is hope for grandparents.Grateful Grandparent. Thank you. Buy the extended version to find out when you have to prepare a statement and get help to write one yourself. Boost your knowledge so you can do more to help yourself and spend less on lawyers' fees. We also offer printed guides as we know some of our users want them. These are expensive as each guide is individually printed as and when somebody requests one.